The long-awaited fourth edition of this best-selling manual continues to offer up-to-date guidance both to newcomers and to the more experienced, on how to make best use of the labyrinth of genealogical sources in England and Wales. It takes into account recent, and even some future, changes to the civil registration system, and incorporates many of the vast sources newly available on the internet. There is also a substantial bibliography for those who discover that their ancestors migrated from other countries. New appendices provide research into underregistration of birth and death, and hitherto unpublished details from the 1915 and 1939 National Registers. 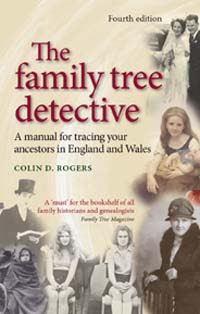 The family tree detective remains an indispensible source of information on how to locate births, marriages and deaths, and alternative strategies if those searches fail. Dr Colin D. Rogers is a Fellow of the Society of Genealogists, a member of AGRA (the Association of Genealogists and Researchers in Archives), and was for thirty years the Hon. General Editor of the Lancashire Parish Register Society. He runs a consultancy helping banks and solicitors to identify and locate beneficiaries. Category: Cultural Studies, History, Sociology	23 Comments.